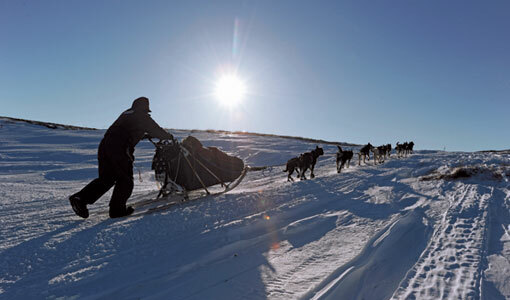 Iditarod sled dogs race across sea and river ice, over two mountain ranges and in winds gusting at 60 to 80 mph. The single-engine plane soared 1,000 feet above the Alaskan tundra, shuddering with every blast of arctic wind. Below, moose looked like flakes of pepper to Michael Leverone, V84, who was flying into Skwentna (population 37), the second checkpoint along the Iditarod dog sled race course. Still he enjoyed the ride. The owner of the Reading Animal Clinic in Reading, Mass., Leverone used to fly small planes for fun. And he was eager to work with sled dogs, which he first encountered during a family vacation to Alaska in 2011, when he visited the racing kennel of 2004 Iditarod champion Mitch Seavey in Seward and the Iditarod headquarters in Wasilla. “It made me realize that the Iditarod is a very big deal, and they need lots of volunteers, including veterinarians, to pull the thing off,” says Leverone. The Iditarod race course is equivalent to more than a third of the width of the continental United States. First run in 1973, the Iditarod commemorates a dog sled run in 1925 that delivered an antitoxin that saved children in Nome from a diphtheria outbreak. Today as many as 100 sled dog teams compete in Alaska’s most popular sporting event. Mushers begin the race with up to 16 dogs each and take anywhere from a little over a week to double that to cross the finish line. They race across often treacherous sea and river ice, over two mountain ranges and against 60 to 80 mph winds. The route itself is equivalent to more than a third of the width of the continental United States. The record time of just under eight days and 20 hours was set in 2011 by John Baker, the first Eskimo to win the race. A rookie volunteer vet, Leverone arrived in Anchorage a few days before the race to participate in a workshop on sled dog medicine. He traveled light, but the items in his duffel bag were heavy-duty: a sleeping bag, pad and bivouac sack that would keep him snug at 20 below; a knife, headlamp and multitool; a surgical instrument pack and medications; a signal mirror and water-purification tablets. A musher beds down sled dogs at the Iditarod checkpoint in Ophir. There are 20-plus checkpoints along the Iditarod trail, which alternates between a southern and northern route in odd and even years. At each checkpoint, race officials record the mushers’ times in and out and confirm that they are carrying the required survival gear. Other volunteers provide mushers with straw to bed down their dogs and their predropped supplies: dog food, food for themselves and spare gear, including extra sled runners. In addition to certifying the dogs as healthy (including a prerace EKG to check the heart rhythm), the job of the 52 volunteer veterinarians, Leverone says, is to examine the dogs at each checkpoint, provide medications for the dogs and advice to the mushers, and care for any animals that have to drop out along the way. At many checkpoints, the veterinarians are the only health-care professionals; some of the vets tell stories of suturing cuts and treating other health issues of the mushers or other volunteers. 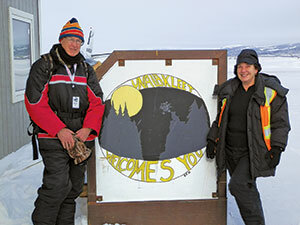 Michael Leverone, V84, bumped into Robin Broomfield, J74, an aviation safety inspector for the FAA’s Anchorage office, on the tarmac in Unalakleet. Broomfield oversaw the operations of the Iditarod Air Force. Leverone worked four checkpoints, to which he was shuttled by the Iditarod Air Force, a fleet of bush planes that, besides ferrying personnel and supplies up and down the trail, also carries dogs deemed unfit to continue racing back to the major pickup points. His assignments ranged from “large” metropolitan areas (the kind that have two stores, a bar and a restaurant) to remote Native Alaskan villages. He slept foot-to-ear in a tiny log cabin, normally used as a post office and heated with a kerosene stove, and in a large community hall in Unalakleet, a town of 700 people on the Norton Sound. A few checkpoints are just tents in the wilderness. “At one point I heard wolverines had gotten into a food cache, and they had to schedule extra plane flights to replace destroyed supplies,” he says. More than 1,000 dogs left the starting line in 2012. Early in the race, the veterinarians’ schedule is intense because the competitors are still packed closely together. As they race at speeds up to 15 miles per hour, sled dogs can experience a host of medical problems not usually seen by veterinarians who care for pets in the Lower 48—sore shoulders and swollen wrists, foot pad tears from pounding over the ice and diarrhea, which can quickly cause an animal to become dangerously dehydrated. The veterinarians are also on the lookout for aspiration pneumonia, which can occur if a dog vomits while running, and exertional rhabdomyolysis, also called tying-up syndrome, a potentially fatal breakdown of skeletal muscle caused by nutritional deficiencies.